Announcing public preview of Azure IoT Hub manual failover feature - IoT Hub cloud service manual failover enables customers to failover an IoT hub instance from its primary Azure region to its corresponding geo-paired region with a recovery time objective (RTO) of 10 min–2 hours. The IoT Hub service provides cross-regional automatic disaster recovery as a default mitigation for region-wide failures or extenuated outages, which has an RTO of 2 – 26 hours. If your business uptime goals are not satisfied by the RTO that the Microsoft-initiated failover provides, you should consider using manual failover to trigger the failover process yourself. Azure Monitor: Route AAD Activity Logs using diagnostic settings - Azure Monitor diagnostic settings enable you to stream log data from an Azure service to three destinations: an Azure storage account, an Event Hubs namespace, and/or a Log Analytics workspace. This allows you to easily route logs from any Azure service to a data archive, SIEM tool, or custom log processing tool. Now you can route your AAD audit and sign-in logs to these same destinations, centralizing all of your Azure service logs in one pipeline. General availability of instance size flexibility for Azure Reserved Virtual Machine Instances - Instance size flexibility for Azure Reserved Virtual Machine Instances is a new feature that makes your reserved instance purchasing and management even simpler by applying reservation discounts to different virtual machine (VM) sizes within the same VM group. With instance size flexibility, you don’t have to deploy the exact same VM size to get the benefit of your purchased Azure Reserved Instances (RI) as other VM sizes within the same VM group also get the RI discount. 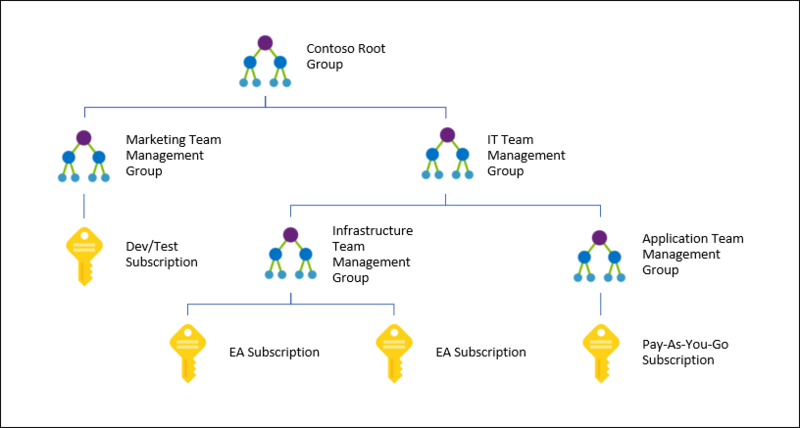 Azure management groups now in general availability - Azure management groups enable you to organize your subscriptions and apply governance controls, such as Azure Policy and Role-Based Access Controls (RBAC), to the management groups. All subscriptions within a management group automatically inherit the controls applied to the management group. No matter if you have an Enterprise Agreement, Certified Solution Partner, Pay-As-You-Go, or any other type of subscription, this service gives all Azure customers enterprise-grade management at a large scale for no additional cost. Management groups not only allow you to group subscriptions but also allows you to group other management groups to form a hierarchy. Announcing Linux on App Service Environment General Availability - Linux on App Service Environment combines the features from App Service on Linux and App Service Environment. Linux customers can take advantage of deploying Linux and containerized apps in an App Service Environment, which is ideal for deploying applications into a VNet for secure network access or apps running at a high scale. Ansible 2.6: What’s new for Azure - Azure in Ansible 2.6 includes four new Azure modules in addition to over 17 enhancements to existing modules that enable a greater range of scenarios for the deployment and management of virtual machines and networking objects. Microsoft and Red Hat engineering teams continue to develop the Azure modules with the Ansible community. Automatic intelligent insights to optimize performance with SQL Data Warehouse - Azure SQL Data Warehouse (SQL DW) now provides intelligent performance insights within the Azure portal. Data skew and suboptimal table statistics are common issues that can degrade the performance of your data warehouse if left unchecked. At no additional cost, SQL DW surfaces intelligent insights for all Gen2 data warehouses and is tightly integrated with Azure Advisor to deliver you best practice recommendations. Managed Disks migration now available in the Azure Portal - Convert VMs with unmanaged Disks to Managed Disks in the Azure Portal without requiring PowerShell or CLI scripts. Azure Managed Disks simplifies disk management for Azure IaaS VMs by managing the storage accounts associated with the VM disks. You only have to specify the type (Standard HDD, Standard SSD, or Premium SSD) and the size of disk you need, and Azure creates and manages the disk for you. The Azure Podcast: Episode 240 - Extreme Azure Automation - Gautam Shah, an Azure Architect with Applied Information Sciences, talks to us about how Azure Automation can be used in Enterprises to automate almost anything. Experts tips on hardening security with Azure security - Learn how the Microsoft Threat Intelligence Center is helping to secure Azure and the global security landscape. The team also has a broad view across many geographies and a view of the services that run in Azure. With this insight, the team can see common attack patterns. These patterns can be at the network level, service level, app level, or OS level. As soon as an exploit is detected, the Microsoft Threat Intelligence Center works with other teams at Microsoft to build mitigations into our products and services. Getting started with IoT: what do you do with all that data? - Once your IoT devices are deployed, secured, and provisioned through Azure IoT Hub, the question remains: where do you send all of the data? The role of Azure IoT Hub is to determine how each data packet needs to be prioritized and where to send it. Knowing how to handle the information you generate, and where to route it, can be a challenge; however, once you start establishing connections, you can begin to comprehend the potential of IoT to transform your business. Real example: improve accuracy, reduce training times for existing R codebase - Retailers have been building product recommendation systems for years, and many of those are built using the programming language R. For older implementations of recommender systems, it’s time to consider improving performance and scalability by moving these systems to Azure. Learn the process of successfully optimizing and reusing an existing recommendation system written in R using the parallelism of the MicrosoftML and RevoScaleR libraries built into Microsoft Machine Learning Server. Azure Friday | Automate Azure Resources with Ansible - Kylie Liang joins Lara Rubbelke to demo how to use Ansible, an open-source, simple IT automation engine for automating cloud provisioning, configuration management and application deployments on Azure. Kylie also shares the roadmap for Ansible on Azure. Azure Friday | HDInsight: Fast Interactive Queries with Hive on LLAP - Murali Krishnaprasad joins Lara Rubbelke to discuss Interactive Query (also called Hive LLAP, or Low Latency Analytical Processing, or Live Long and Process), which is an Azure HDInsight cluster type. Azure Friday | Execute Jars and Python scripts on Azure Databricks using Data Factory - Gaurav Malhotra joins Lara Rubbelke to discuss how you can operationalize Jars and Python scripts running on Azure Databricks as an activity step in a Data Factory pipeline. Microsoft Azure Data welcomes Data Platform Summit attendees - Data Platform Summit 2018 is taking place in Bangalore this week. Data Platform Summit 2018 is the only Data Platform Conference in Asia focusing on Microsoft Data Platform and Open Source. Rohan Kumar, Corporate Vice President, Azure Data will be there to deliver the keynote and share the work happening on the Azure Data team at Microsoft. In this post, Rohan covers the key trends that are defining and shaping the evolution of data management, and how Microsoft delivers a consistent and global platform optimized for hybrid cloud for all applications and data. Responsibilities of a partner/system integrator in managing Azure Cosmos DB - Many customers are using Azure Cosmos DB all around the world. This article lists the actions a partner can perform in different areas of Azure Cosmos DB such as security, performance management, and more. Azure Marketplace consulting offers: April - Earlier this year, the Azure Marketplace ecosystem added consulting offers to the growing lineup of software providers. In April, we published 73 new offers that met the onboarding criteria. The IoT Show | IoT In Action - Powering Energy Efficiency with Azure IoT - Curious about how Microsoft is leading the smart energy and digital transformation initiatives with Azure IoT? Get a sneak peek at the upcoming Microsoft's IoT In Action Webinar during which you will learn how the energy industry benefits from a myriad of IoT use cases, both on the consumer level and the industrial level. The IoT Show | Azure IoT Inception and Vision - Sam George, Partner Director for Azure IoT Program Management, tells us all about Azure IoT inception and vision. Financial Services | How to upgrade your financial analysis capabilities with Azure - To assess risk, analysts review research, monitor economic and social conditions, stay informed of regulations, and create models for the investment climate. In short, the inputs into an analysis make for a highly complex and dynamic calculation, one that requires enormous computing power. Get a technical overview of using Microsoft Azure to support and enhance risk grid computing in banking, including recommended systems and high-level architectures. Retail | Azure cloud business value for retail and consumer goods explained - Cloud technologies are enabling new capabilities and those new powers are disrupting the business models of traditional retailers and sellers of consumer goods. The cloud is at the heart of digital transformation. It is no longer a question of “if,” but “when” and “how” to move to the cloud for most brands. To move an e-commerce solution to the cloud is a significant task, with costs that must be understood by a decision maker. Take a look at a path a retail business can take to migrate its existing infrastructure to Azure. Health and life sciences | Improve collaborative care and clinical data sharing with blockchain - Blockchain offers new capabilities to greatly improve health information exchange. At Microsoft we are working to maximize the benefits of solutions that have the potential to improve patient outcomes, reduce healthcare costs, and enhance the experiences of patients and healthcare workers. Learn about a new partner solution and pilot for a better health information exchange that uses blockchain, and runs in Microsoft Azure. Azure This Week - 3 August 2018 - In this Java-themed episode of Azure This Week, Lars goes through four new services for the Azure platform: Support for Java SE running on Linux in Azure App Services, Asynchronous Azure Storage SDK for Java, new recommendations in the Azure Advisor and some new features for Azure Blockchain Workbench.